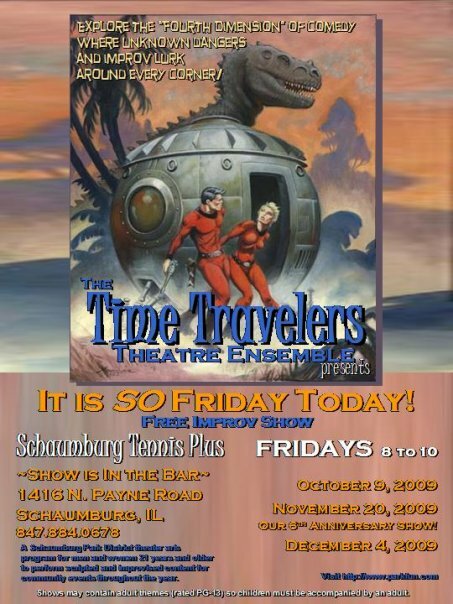 On November 2nd and December 14th, The Time Travelers will be performing their world famous FREE Improv shows at the Schaumburg Tennis Plus. Showtimes are 8 PM and there is a cash bar with food available. -"Just some guy"
Description.We are doing a set at the Relay for Life event in Hoffman Estates. And remember, you can also see us monthly at Schaumburg's Tennis Plus for FREE Improv in the Bar! on Friday June 18, July 9 and August 6 at 8PM. The Time Travelers Theatre Ensemble, running for it's 6th year, is having a Free Improv Show at Schaumburg's Tennis Plus on the following Fridays. Friday, November 20, 2009 (8-10PM) - Our 6th Anniversary Show!!! Free Admission, Reasonably Priced Drinks, Typical Bar Menu. Bring Your Friends, Husbands, Wives, Girlfriends, Wife's Girlfriends (we don't judge), Rabbis, Dentists, etc...and be ready for a fun time in the burbs! Shows are considered "PG-13 content"